One of the remarkable aspects of Jai Singh’s observatories is that each site is distinctly different in size, layout, and style. While the instruments he designed are essentially the same in principle, the versions at different sites vary in size, materials, and construction. The first observatory to be built was the observatory at Delhi in 1724. The Jaipur observatory, the most elaborate, was begun by 1728. Smaller observatories were built in Benares, Ujjain, and Mathura. 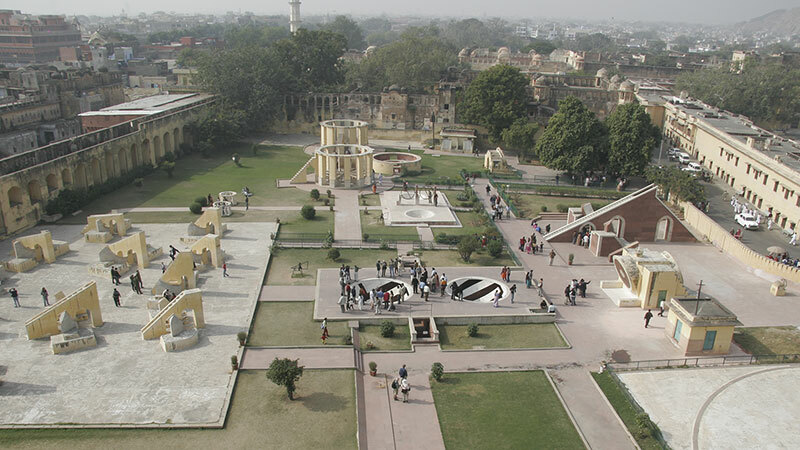 Of the five observatories, all except the observatory at Mathura still exist and are publicly accessible. The Mathura observatory, and the fort in which it was housed, were demolished just before 1857. The observatories at Delhi and Jaipur are the best known and most visited, since they are within major tourist destinations. They also feature the largest versions of the instruments Jai Singh built, and the Jaipur observatory houses the greatest number and variety of instruments.